With both players 2-1, only the winner would have the chance of making Top 4 and have a run at the Mox. Both players began the first couple turns with just land, developing their hands with a couple end of turn Think Twices, but Ryan attempted an end of turn Midnight Haunting. Donald exiled it with a Dissipate. Ryan added a Sword of Feast and Famine to the board, as well as an Inkmoth Nexus. 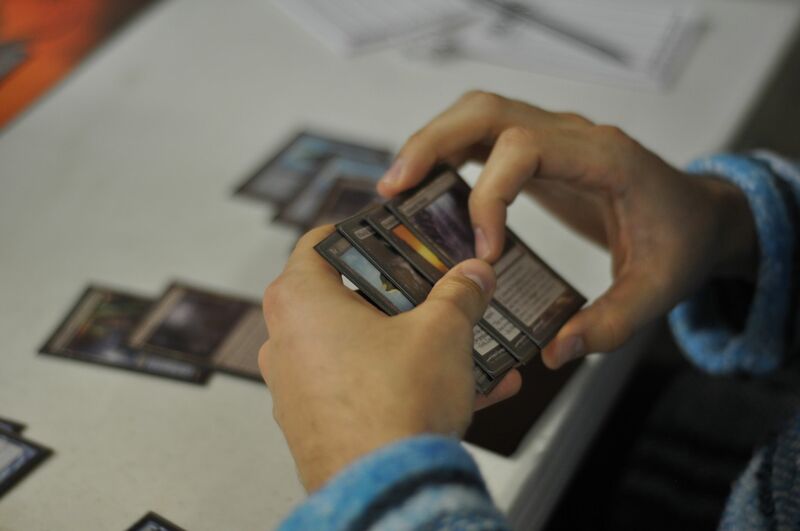 Both players passed their next turns, but at the end of Ryan’s turn, Donald cast a Forbidden Alchemy, throwing an Reassembling Skeleton, Black Sun’s Zenith, and Plains to the graveyard. Donald immediately paid the 2 mana to reassemble the Skeleton back into play. The Skeleton took 1 point of life from Ryan, but Ryan played a Forbidden Alchemy when Donald ended his turn, putting two Plains and a Mana Leak into the graveyard. Donald chooses which card to keep and which ones to throw away with a Forbidden Alchemy. Donald sent the Skeleton in for another damage, and Dissipated Ryan’s Snapcaster Mage at the end of Donald’s turn. Ryan thought for a second, then cast his own Dissipate to force his Snapcaster Mage into play, but in doing so, lacked the mana to take advantage of Snapcaster’s comes-into-play ability. Ryan attemped to give his Sword to the Mage, but Donald stopped it with a Doom Blade. Donald added his own Sword of Feast and Famine to the board. Ryan had a Negate but Donald countered it with his own Negate. The Reassembling Skeleton took up the Sword and attacked Ryan, but Ryan chumped with an Inkmoth Nexus. With Donald tapping out to keep the Sword of Feast and Famine in play, Ryan took advantage of this by casting a White Sun’s Zenith for 4. Donald animated both his Inkmoth and equipped one of them with a Sword to poison Ryan for 4. One of Ryan’s cats took up a Sword of his own and attacked back for 10 damage. Donald flashed in a Snapcaster Mage to chump the equipped cat, taking only 6 damage and brought his Reassembling Skeleton back for defense. Donald repeated his plan from the turn before, but Ryan had a Ghost Quarter for the Sworded Nexus, poisoning Ryan for only 1 more. Ryan swung with all of his creatures once again. With the Skeleton blocking one of the cats, Donald took 8 damage, going down to 6, and he attempted to flash back a Black Sun’s Zenith with Snapcaster, but Ryan Negated it. The swing the next turn from Ryan’s army of cats took the match.